From the products we use to build them to the energy they use every day, our homes have a large impact on the environment. That's why building companies are developing products that have a lower environmental impact. 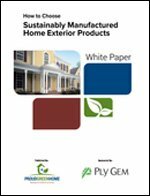 This white paper reviews looks at some of the ways that exterior building products offer sustainable options for your home project.